TimeFusion allows you to combine the power of Infusionsoft with your online appointment scheduling service. TimeFusion puts the Appointment on your Infusionsoft calendar and adds the Contact Record if needed. 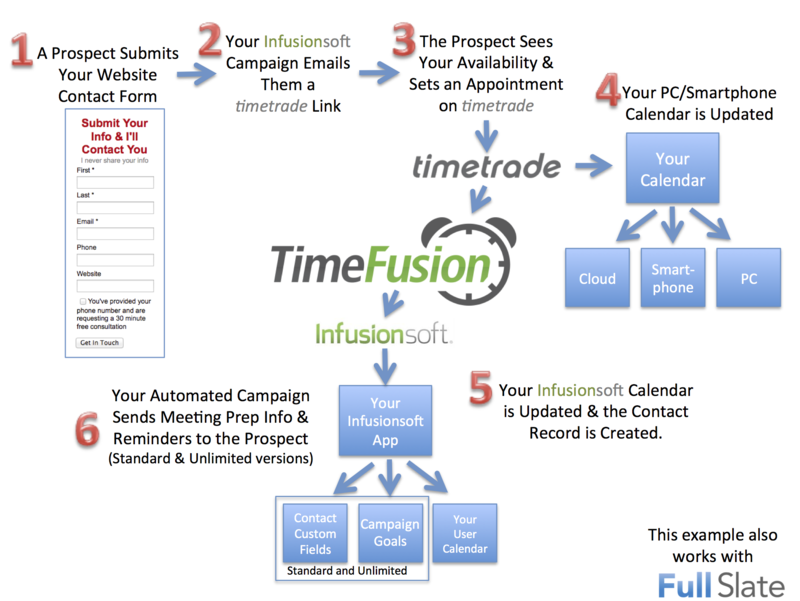 TimeFusion Unlimited triggers any Infusionsoft campaigns for each different Appointment type you have. TimeFusion Lite delivers integration between TimeTrade and Infusionsoft – when an appointment is scheduled through TimeTrade TimeFusion adds the contact in your Infusionsoft app (if needed) and installs the appointment on the owner’s Infusionsoft calendar. And don’t worry about editing your calendar—it will automatically be updated when appointments are canceled or rescheduled through TimeTrade. Go further and leverage the power of Infusionsoft automation by triggering an Infusionsoft campaign goal/sequence when new appointments are set. Use a campaign to automatically acknowledge the appointment and follow up with advance information and meeting reminders, or trigger an automated nurture campaign. Unlimited is by far the most popular version because it also triggers Infusionsoft campaign goals/sequences when new appointments are set AND it places no limits on the number of campaign goal trigger sets – Each set including Confirm (New), Reschedule & Cancel Appointment campaign goals. Date and time values can also be captured into separate custom fields for each appointment type. Every appointment type you have configured in Timetrade or Full Slate can be associated with a different set of campaign goals and custom fields in Infusionsoft. TimeFusion Unlimited supports both Timetrade and Full Slate. Whether you prefer Timetrade, Full Slate, or both; with TimeFusion Unlimited you may use both scheduling services at the same time with one TimeFusion account. Get all the features and benefits of TimeFusion Unlimited, with powerful SMS Messaging features. Send an SMS using a simple email message in an Infusionsoft campaign. And if your customer replies to the SMS, you have the ability to personally engage in the real time conversation, making sure your customer is delighted with your services. You can precisely schedule the sending of the SMS so it works perfectly as an appointment reminder. TimeFusion Messenger is the lowest cost SMS messaging solution for Infusionsoft. 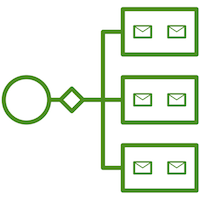 With TimeFusion Messenger, you create a separate account with Twilio to handle SMS delivery. Twilio’s fees are extremely competitive, charging only $1.00/mo for a phone number and $0.0075 per SMS message sent or received. If you purchase TimeFusion Unlimited you are eligible for the $49 Appointment Management Campaign. The order buttons work both for new accounts and to upgrade an existing account. To upgrade just use the same email address used when you ordered previously, insert it on the order form for the new version and your existing account will be upgraded to that version. Note: An account with TimeTrade or Full Slate is not included and must be established separately. *After sign-up you can Click here to increase the Full Slate Appointment Limit. *After sign-up you’ll receive instructions for establishing a separate account at Twilio. If you purchase TimeFusion Unlimited you may also be interested in the $49 Appointment Management Campaign. Try It FREE For 6 Months, No Credit Card Required! Interested but not quite ready to buy? No problem! Try TimeFusion Lite FREE for 6 months, no credit card required! Note: We never share your information. When you sign up for TimeFusion you will be assigned a timefusion.biz email address to use with TimeTrade and Full Slate. TimeFusion will then receive the appointment confirmation emails and forward them to your normal email address. Please contact us if you are interested in a Multi-User subscription. TimeFusion is awesome! It’s simple to use and seamlessly connects TimeTrade with Infusionsoft. All I can say is I can’t remember ever having such excellent customer support! …I love how simple the system is to get prospects to book consultations with me at their convenience and in the time frame I am actually available. The one pain I was experiencing is following-up with these booked appointments and Time Fusion solves that! Just wanted you to know that I’ve been using the texting tool and its been very helpful to keep people engaged – I’m loving it!